Easy Chili Recipe. Quick and filling! 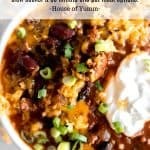 This easy chili recipe can be made in the slow cooker or as a one pot 30 minute meal. Loaded with beef, beans, chiles and more this hearty chili is perfect for loading up with all your favorite toppings. This particular recipe can be made on the stovetop in a Dutch oven or large pot. Or it can be made in the slow cooker! It just depends on your preference and time schedule. 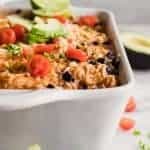 If you have time in the morning to prep the ingredients and allow this to cook all day to be ready for an easy dinner go the slow cooker route. 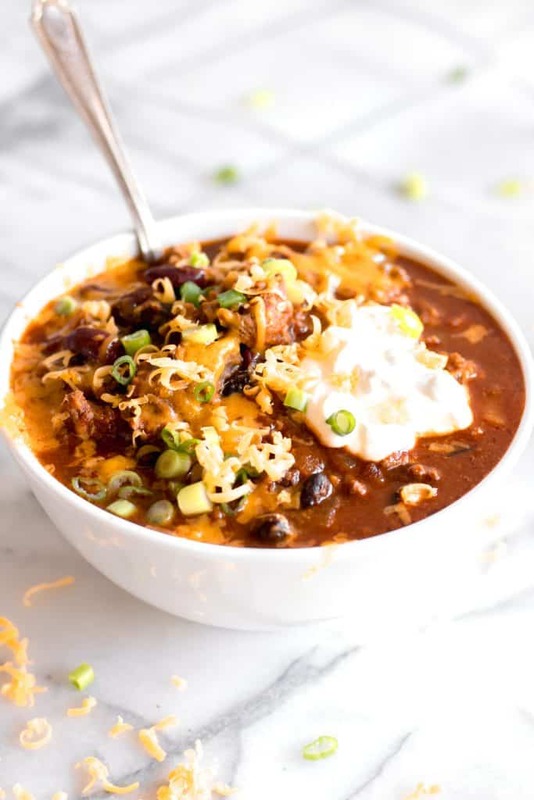 If your schedule gives you 30 minutes to create a flavorful meal right at dinner time, then this one pot 30 minute chili recipe is for you! How Do You Make a 30 Minute Chili? Start with browning the ground beef and cooking the onion in the pot. Drain the grease and then add the remaining ingredients and allow them to simmer together for at least 20 minutes. How Do You Make Chili in a Slow Cooker? Start by browning the beef and cooking the onion in a skillet. Add that to the slow cooker then add the remaining ingredients and allow it to cook and simmer on low for 4-6 hours. What kind of spices are used in chili? 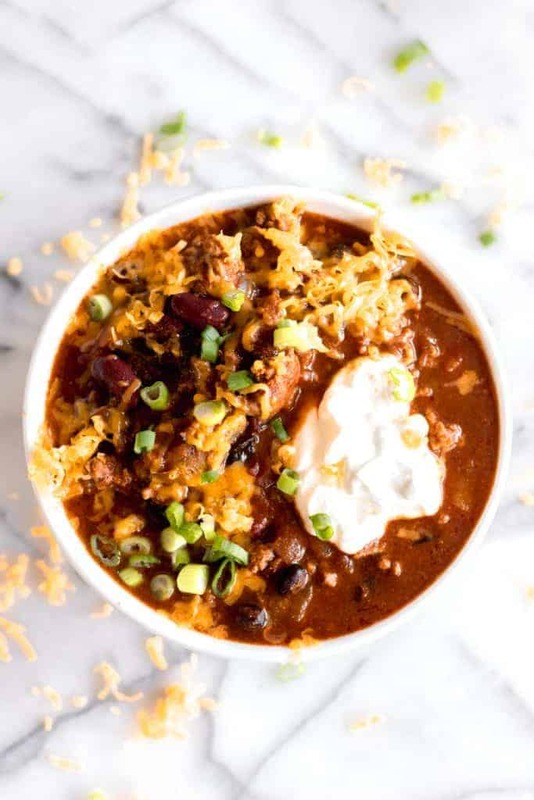 A healthy dose of chili powder gives a hearty depth of flavor and the slightest bit of heat to this easy chili recipe. Other spices added are black pepper, salt, garlic powder, some cumin and I always like to add just a bit of light brown sugar to cut through the acidity of the tomatoes. 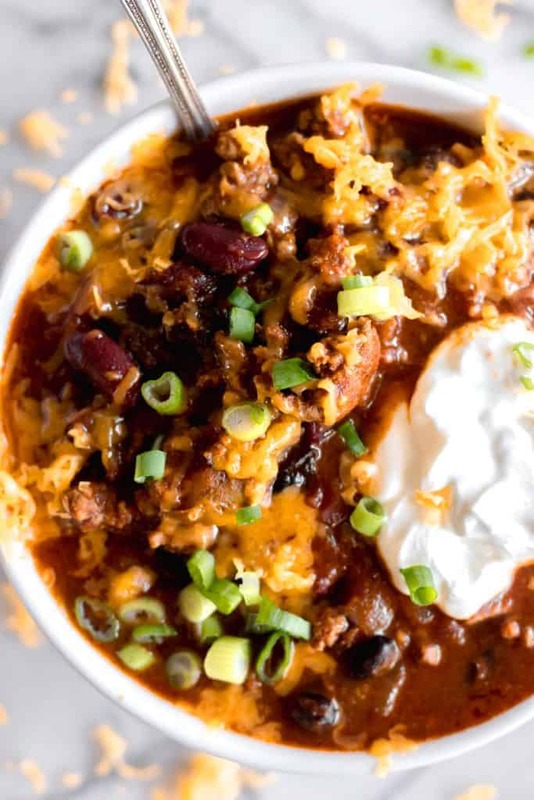 With this chili being so quick and easy to make, it’s just as easy to make a big batch of it and save some for another night. Cool the chili completely, pour into a freezer gallon size bag, press all of the air out of it then seal closed. Lay it flat in the freezer to let it freeze in an easy to store shape. The chili can store in the freezer for up to 3 months. 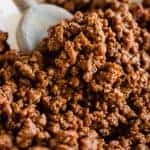 When you’re ready to use the freezer chili then you can simply remove it from the freezer, and allow to thaw in the refrigerator for the day or overnight. Then pour the chili into a large pot, bring to a simmer with a lid on to retain moisture. Add any additional seasonings as needed and enjoy! 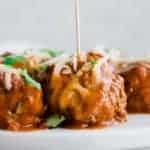 WANT TO TRY THIS EASY CHILI RECIPE? Add the ground beef and onion to a medium size skillet. Cook over medium heat until the onion is soft and the beef is completely cooked. Add the garlic and cook an additional 30 seconds. Remove from heat, drain grease, and add meat mixture to the crockpot. Add in all the other ingredients, stir to combine. Cook over low heat for 4-6 hours. Add the ground beef and onion to a large pot or dutch oven. Cook over medium heat until the onion is soft and the beef is completely cooked. Add the garlic and cook an additional 30 seconds. Drain any grease and return to heat. Add all other ingredients to the pot, stir to combine and bring to a simmer. Cover and allow to simmer for about 15-20 minutes. I love this recipe. I’ve made it a couple times now. My husband loves it and even my kids gobble it up! We just tried this for the first time, and it was awesome! I made it without ground beef though (need to go grocery shopping lol) but was able to add some beef bullion. So if yall try it meatless, I’d do a 7oz can of tomato sauce instead of 14oz. It was super saucy without the meat, so we just mixed in rice. Perfect! I really appreciate how versatile this recipe is as well! Not only for having a stove top option which is ultra fast (thank you, Jesus! 😂) but also because you could throw pretty much anything in here. Carrots, zucchini, corn, whatever. Sky’s the limit! Thanks so much for the review Pauline! Love the tip for adding less sauce if going meatless. And yes! This recipe is definitely versatile. You can really change it up to make it how you want. Awesome recipe! Very close to my homemade version with your great additions. Thanks so much Lucy! So glad you enjoyed it! We just made this tonight on the stove top. My husband said it’s the best chili he has ever had. I might have to agree! Love that it’s pretty quick and simple. We followed the recipe as described. Thanks so much Sarah! So glad that you enjoyed the chili. Thanks for the review. I’ve made this twice. My go to chili recipe. I used a can of original rotel in place of tomatoes and green chilies. Just dumped it in. In place of the beans I used one can of chili beans not draining. It is quick and delicious. I honestly can’t stop eating it. Top with grated cheese, sour cream and chopped green onions. Delicious, and just what I was looking for. Easy to make but with wholesome ingredients. Thanks! Very good and easy! We loved it. I made this recipe today (doubled it so I could freeze leftovers, if there are any!) I made a few additions by adding diced green peppers to the sauteeing onions and also added 2 small bay leaves. I did not double the cans of beans as there were plenty with just the 1 can of black beans and 1 can of kidney beans. The house smells heavenly! This chili will pair well with the homemade Focaccia bread I made yesterday! From one Texas gal to another, “this here’s a keeper!”…Thank you Serena! Loved it!! My daughter helped me make it and eat it as well. We did all organic ingredients too! Loved it! I used 1 lb ground turkey and 1 pound ground beef and doubled all the other ingredients. Served it over Mac with cheese and onions! Perfect flavor! I’ve been making scratch chili for years, but don’t usually measure anything. That requires a lot of tasting and adding a little more of this or that. I thought I’d try this recipe because if it’s simplicity. I can say for sure that if you make it exactly as written, Serene’s chili is better than yours. In the video, I saw her secret weapon and it’s Gebhardt chili powder. That stuff is head and shoulders better than any available outside of Texas. It’s available online still, but I quit doing that a few years ago. I made a few changes to compensate for my personal taste. I doubled cumin and added 1/4t paprika & cayenne. Used white sugar, but also added 1T ketchup to cut acidity. Thanks for posting the recipe Serene! I just made this and I must say it’s the worst thing I have ever put in my mouth . really spicy . wast of money and time . Wow Alan, that’s quite the statement. The absolute worst thing you’ve ever put in your mouth?! As for this being really spicy, there really isn’t any heat to this, so I’m wondering if maybe you misread the ingredients? If it’s the chili powder that you find spicy, then you can cut it back. 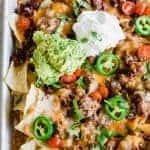 Can I use ground turkey instead of beef? My first time ever making chili I use this recipe, and now it’s the only one I hear this! Absolutely delicious and so fast. I now I always make sure to keep the ingredients in the house so I can make it on a whim. Making it right now actually!